Photographer Mansi Thapliyal visits the temple town of Kedarnath, one of the worst affected areas during last June's devastating floods in Uttarakhand state. 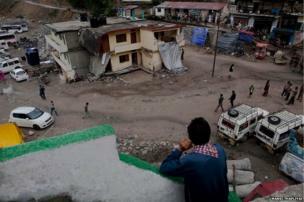 Thousands of people were swept away in last June's devastating floods and landslides in the northern Indian state of Uttarakhand. Photographer Mansi Thapliyal recently visited the temple town of Kedarnath, one of the worst affected areas, to see how it was coping a year later. Even today the main market at Kedarnath resembles a ghost town, with personal belongings, utensils and furniture scattered all around. 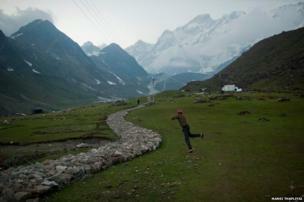 Despite the dangerous conditions caused by last year’s floods, pilgrims have returned to the Himalayan mountains. 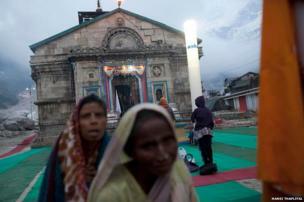 The state tourism office in Kedarnath says 700-800 pilgrims visit the shrine each day. 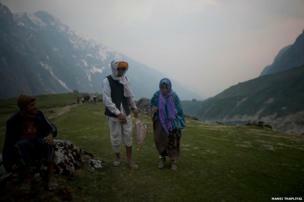 This elderly couple from Rajasthan are on their way to Kedarnath. The government is not allowing people to go ahead if they are medically unfit. People who are coming from far off, with faith and sometimes spending half of their earnings on the trip, are disappointed with this arrangement. 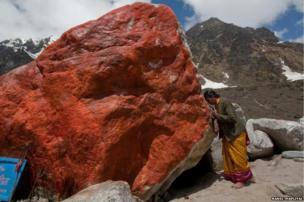 A pilgrim offers prayers at a large rock with its side painted saffron. According to reports, this rock helped divert flood waters away from the temple last year and many today believe it to be sacred. 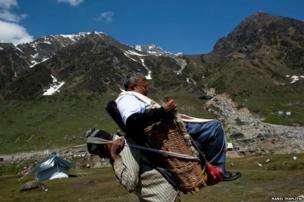 Bankelal Rathore, 55, a teacher from Madhya Pradesh state, visited Kedarnath in 2012 with his wife. He said that he was shocked to see the extent of the damage caused by the flooding. 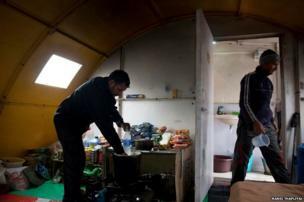 "We couldn’t find the guesthouse we stayed in last time. It has disappeared," he said. Nine-year-old Anita helps her mother run a roadside teashop in Kedarnath. Until last June, her family ran a guesthouse which was destroyed by the floods and all of their belongings were washed away. 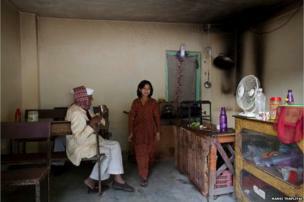 The floods have left her father mentally unstable, and unable to work. 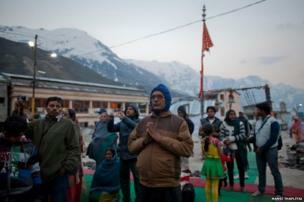 Manoj Chandra and Rakesh Negi from the state police force have been based in Kedarnath for the past three months. They were assigned to build a new route to the temple and remove bodies still buried under several feet of snow. 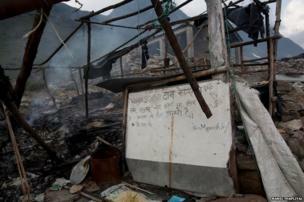 Mr Chandra said: "My brother who was also in the police died in the floods, I came looking for his body." 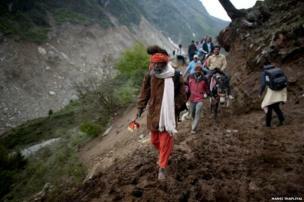 With the traditional trekking route to Kedarnath in a shambles, a new path has now been developed for the pilgrims. Until last year, pilgrims would trek for 14km (nine miles) to reach Kedarnath from the village of Gaurikund, but the footpath was washed away and now they have to walk more than 20km (12 miles). For centuries, pilgrims have flocked to the area drawn by the Hindu belief that it was here that deities such as Lord Shiva and Vishnu resided. Sonprayag town, on the way to Kedarnath, was reduced to rubble in the floods, but now the local people and the authorities are trying to rebuild it. 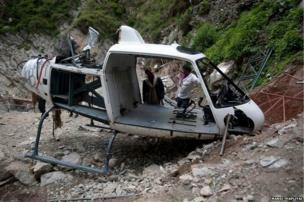 During rescue operations last year, five government helicopters crashed on the way to Kedarnath. 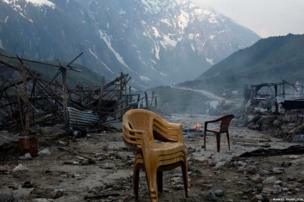 A year on, the debris is yet to be cleared.